Project Butía turns your XO laptop into a robot! As previously mentioned I spent my last day in Uruguay at ceibalJAM's second miniJAM! artistico (photos from the event can be found on ceibalJAM's blog). Apart from my short talk about the various efforts by OLPC (Austria) and other European OLPC and Sugar communities (which was the first time since school that I gave a presentation in Spanish! ), being able to meet a lot of great people and say my good-byes to them, my favorite part was when the team from Butía took the stage and presented their robotics project. The goal of the project that is run by Universidad de la República's Faculty of Engineering is to create an inexpensive robotics platform to attract students in public schools to robotics and programming. Having somewhat of a thing for robotics, especially when it comes in combination with an XO, I was immediately fascinated by these efforts. Gonzalo Tejera started his talk with a general introduction into the progress that robotics has made in the past few years as well as describing the current status quo of the use of robotics in education (or lack thereof due to the high cost of many available kits). Then he outlined the history of the Butía project before diving into the meat of the talk. The heart of the Butía platform currently consists of an Arduino board which is used to both control the motors to drive around the acryl platform which the XO sits on and to connect all kinds of ambient sensors to it. However Butía took care to develop a modular design so that using an alternative board such as USB4all or GoGoBoard instead of the Arduino is relatively hassle-free. 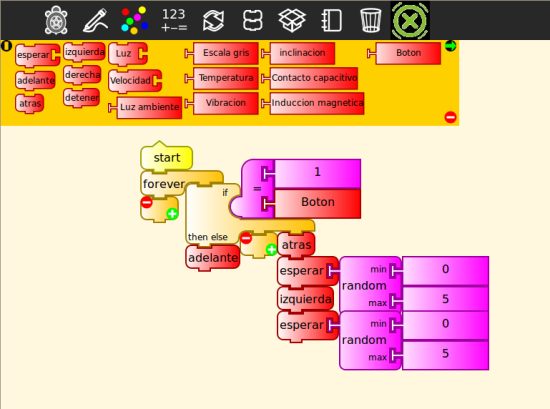 The really cool thing though is in the software as Butía has worked very hard to make it as easy as possible to program the platform via Sugar's standard tools such as Python and, even cooler in my opinion, the TurtleArt activity. What this means is that within TurtleArt there are extra blocks which can be used to read sensor values, control the wheels of the platform or do a broad variety of other things. Admittedly I think that TurtleArt is cool to begin with but being able to control a physical object rather than just seeing a turtle move around on a screen as a result of your work is just absolutely awesome! Now that the majority of the engineering work is done it will be interesting to see how the project will be integrated in schools. Butía is working with people and organizations from the education sector so I'm confident that we'll see cool projects coming out of Uruguayan schools over the coming months and years. I for one know that I would have loved to be able to be able to work with something like the Butía platform when I was at school. Well, actually I'd still love to be able to work with this project today!